DAVID LE/Staff photo. 3/7/15. 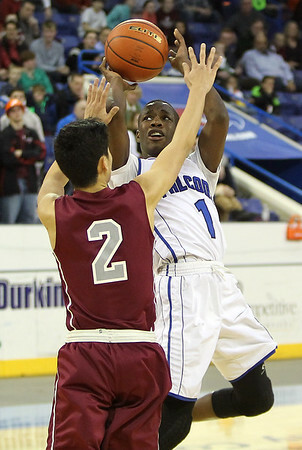 Danvers junior Rashad Francois (1) takes an off balance shot over Arlington senior Jaewoo Chung (2) during the D2 North Championship on Saturday afternoon at the Tsongas Center in Lowell. The Falcons defeated Arlington 50-47 to capture the D2 North Championship.